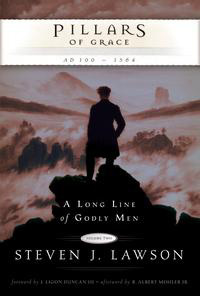 It is impossible to determine the impact that Reformation Trust’s, A Long Line of Godly Men Series will have. have personally been enriched, challenged, and inspired by this excellent series that has surveyed the likes of Jonathan Edwards, John Calvin, Martin Luther, C.H. Spurgeon, and John Knox. 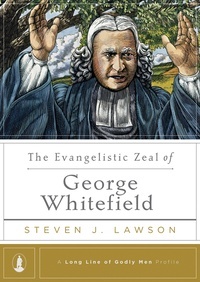 The latest installment, The Evangelistic Zeal of George Whitefield by Steven Lawson packs a powerful punch and will leave readers hungry for more. Several features make Dr. Lawson’s latest work noteworthy. First, the book is very interesting and readable. It is filled with historical facts that help readers contextualize the arena that Whitefield ministered in – on both sides of the Atlantic. Second, the book raises critical awareness about the biblical relationship between the doctrine of election and the need to evangelize. Lawson is quick to point out that while Whitefield embraced the doctrines of grace, he was also eager to proclaim the gospel to every creature – a scathing indictment of hyper-Calvinism and a challenge to anyone who scoffs at the two-fold truths of election and evangelism. Third, the book provides an inside look at a man who faced a myriad of trials and tribulations. Every preacher, indeed, every Christ-f0llower experiences trials. But I have yet to meet a pastor who was met by an angry mob who hurled dead cats and rotten fruit onto the platform. Whitefield endured this and more. Yet he endured each tribulation and he passed the test. Fourth, the book acquaints readers with the evangelistic zeal of George Whitefield. Here is a man who took the Great Commission seriously! His ministry led to countless conversions – all a result of faithful proclamation. Whitefield was a man who refused to compromise the truth. He delivered the truth with power and passion. And a multitude of lives of changed as a result of his preaching ministry. Lawson cites Arnold Dallimore who writes about the God-centered stature of George Whitefield: “And what manner of men will they be? Men mighty in the Scriptures, their lives dominated by a sense of the greatness, the majesty and holiness of God, and their minds and hearts aglow with the great truths of the doctrines of grace.” Oh that men in this age would model the Whitefield approach. May their hearts be consumed with nothing but the greatness of God. And may people from every tribe and nation be drawn to the sovereign Savior. Pulpit Aflame – Joel R. Beeke and Dustin W. Benge, Ed. In 2007, I listened to Dr. Steve J. Lawson preach for the first time at the Shepherds’ Conference (Grace Community Church). The title of the sermon was Bring the Book, an exposition of Nehemiah 8:1-8. I remember being mesmerized by Lawson’s authority, passion, and his ability to handle the Word of God. The pulpit presence of Lawson riveted my attention on the text and rallied my affections around the great theme of God’s glory. Later in the day, I listened to Lawson explore the contours of George Whitfield’s life and ministry. The following day, Lawson joined John MacArthur and several other pastors for an extended Q & A session. Pastor John asked Steve Lawson to share about his departure from Dauphin Way Baptist Church in Mobile, Alabama. I vividly remember tears welling up in my eyes as Lawson recounted the animosity he experienced when he preached about the doctrines of grace. I too, experienced similar opposition. Eventually, Lawson resigned and move on to plant Christ Fellowship Baptist Church. I have since listened to hundreds of sermons by Steven Lawson and have poured over his books and articles that address pulpit ministry and Reformed theology. While many have influenced my preaching ministry, no living person has influenced me more than Dr. Steven J. Lawson. Numerous expositors have been influenced by Lawson’s ministry. Pulpit Aflame is a fitting tribute to a man who has given his life to preaching the gospel of Christ and training men to do the same. The book is edited by Joel Beeke and Dustin Benge. Thirteen fellow expositors offer contributes in this volume that focuses on the preaching task. The book is arranged in three parts including the mandate of preaching, the meaning of preaching, and the motivation of preaching. Authors include the likes of Al Mohler, John MacArthur, R.C. Sproul, and Sinclair Ferguson. Each contributor sets forth a particular aspect of preaching which magnifies the great God of the universe. Each contributor expresses deep admiration and respect for Steven Lawson. I highly commend Pulpit Aflame. I recommend that preachers pour over these pages and find confirmation in the important task before them. May these essays challenge, comfort, and confront a new generation of preachers who are committed to wielding the mighty Sword so that nations would find their joy in Christ. May pulpits around the world catch fire as they follow the example of Dr. Steven J. Lawson. 2014 marks the 500th anniversary of the birth of John Knox, the Protestant Reformer who risked life and limb for the sake of the gospel in Scotland and much of western Europe. 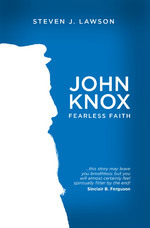 Steven Lawson retells the story in his newest work, John Knox Fearless Faith. Through these many dangers, Knox persevered in his ministry, boldly preaching the Word and trusting God for the outcome. Beneath his frail body was an unshakeable confidence in the sovereignty of God. He believed that his times were appointed for him by an all-powerful God. He knew that he was invincible within the allotted time of the divine will. His faith remained strong in the One who orders all things. As Knox approached his final years, his commitment to God grew yet deeper. The opposition he faced never subsided, even to the end, but neither did his confidence in God. 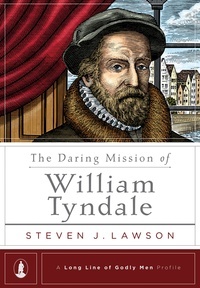 May pastors find strength in this godly man whose birth 500 years ago marked church history and changed a generation. May John Knox fuel our resolve to boldly preach God’s Word and wield the mighty sword of Reformed truth for the world to see and savor. May pastors lead the next generation of Christians who live with the integrity and the zeal of Knox. May they rebuke and admonish carnal professors who seek to divide Christ’s church. May they be inspired by his example as they champion the cause of truth and challenge every rival from Rome, Mecca, Salt Lake City and every heresy that poses a threat to the gospel! Twenty years ago, Steven Lawson penned the book, Men Who Win. 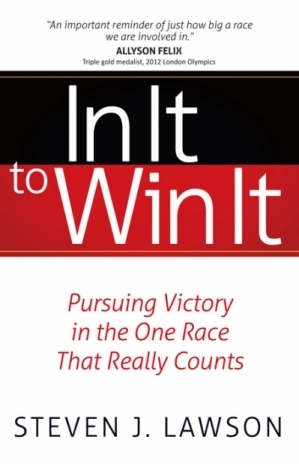 In It to Win It is a fresh and updated version of his original work that points readers to the race that matters, namely, the Christian life. In It to Win It is packed with practical advice that is saturated with biblical wisdom. Dr. Lawson directs Christian runners to the starting line and sets forth the aim of the book: “My desire is that God will ignite a fire within you to live victoriously in what truly matters in this life. My goal is to help you chart your course, set your pace, and point you to the finish line. My stated aim is to help you design a game plan so that you may ‘run in such a way that you may win. '” In this short volume, the author successfully guides readers to the blocks and sends them running with the intention of glorifying God. Readers are encouraged to enter the right race, pursue rewards, and commit themselves to a rigorous training program. Healthy runners drink deeply from the never-ending well of God’s Word. Runners are urged to feast on the truth of God’s Word and strive to attain spiritual victory. They are encouraged to model the God-centered faith of saints like Abraham, Moses, and Noah. They are challenged to remove obstacles that hinder them from running the race. Ultimately, these runners are urged to keep their focus on the Lord Jesus Christ and to faithfully follow him all the way to the finish line. Dr. Lawson warns runners about the possibility of being disqualified. He spends some much-needed time warning about the consequences of sexual sin in particular. At the end of the day, In It to Win It is a practical guide about the doctrine of sanctification. Sports fans will greatly benefit as the author includes several examples from the world of athletics that he directly ties to the Christian race. Here is a book to read, digest, and put into action immediately. And ultimately, this practical guide will help runners enter the right race, run the race with their eye on the prize and cross the finish line – all to the glory of God! Pillars of Grace by Steven J. Lawson is the second installment in his series, A Long Line of Godly Men. In volume one, Lawson walked readers through every book of the Bible and demonstrated how the doctrines of grace emerge on every page of Scripture. Volume two also alerts readers to the precious doctrines of grace. However, this volume shows how these God-centered doctrines emerge in the writings of the early apologists, church fathers, medieval theologians, and the Protestant Reformers. The author quickly reveals his purpose for writing at the outset: “As we trace this long line of godly men from the first century to the sixteenth century, may the Lord use these pages to raise up new messengers who will sound the trumpet of His distinguishing grace. In this hour, may He prepare a new generation of renewed minds and passionate hearts to proclaim these glorious truths of Scripture.” Lawson accomplishes his goal in this weighty book, which spans over 530 pages. From the beginning, the book has a sort of predictable cadence. The author presents a brief historical overview that helps set the stage for introducing a given historical figure. Next, the author includes helpful biographical data that concerns the historical figure under investigation. Specific writings are introduced and briefly evaluated. The most helpful section includes a discussion how the historical figure under consideration interacts with the doctrines of grace. Issues include the sovereignty of God, radical depravity, unconditional election, irresistible grace, particular redemption, perseverance of the saints, and the doctrine of reprobation. Finally, Lawson concludes each chapter with a challenge that is directed to the reader, and is specifically directed to pastors and professors. Each challenge beckons readers to hold forth the doctrines of grace, to courageously proclaim the truth of God’s Word, and contend earnestly for the faith. I applaud Dr. Lawson for courageously proclaiming and promoting the truth of God’s Word. Some of the truths contained in this book are very unpopular. But truth is never dictated on the basis of consensus, relevance or popularity. Dr. Lawson introduces readers to heroes that one might expect – heroes like Augustine, Wycliffe, Luther, Tyndale, and Calvin. But he also focuses his attention on the lesser knows – men like Isidore of Seville, Gottschalk of Orbais, and Bernard of Clairvaux. These lesser known figures are a tremendous encouragement for anyone who is investigating the development of the doctrines of grace. While Lawson’s work is theological and historical in nature, it reads like an in-depth, theologically charged devotional. It is filled with God-centered citations and motivating examples of godly living and courageous Christian conduct. Pillars of Grace is a theological tour de force. It is essential reading for pastors who seek to integrate historical theology into the regular preaching menu. It is essential reading for students who are investigating the roots, depth, and breadth of the doctrines of grace. Pillars of Grace is a crucial antidote, especially in a culture that has caved in to the musings of Pelagianism. Pillars of Grace upholds the truth of sovereign grace in a winsome, biblical, and God-centered way!